People take pictures for different reasons. Some like to take snapshots of family events as they unfold, others are setup artists who prepare scenes ahead of time. Some like to be up front and in the middle of the action to capture the details of a moment as close as possible. Others like to act as a "spy" and watch a scene unfold from afar, capturing the blended emotions and imagery that emerge outward. Whether you're one extreme or the other, or somewhere in between, we all take photos to collapse that moment of time into something we can keep with us. We print them, post them, scrapbook them, mount and frame them...anything we can to allow the magic of a moment to live again. Sometimes our efforts to boil down that emotional moment into a nice little package completely backfire. The scene doesn't compact, rather it explodes into something more, something that will never fit on a photograph no matter how many mega-pixels you have. This is exactly what happened due to the photo above. Up at 330am, I arrived at the monuments on the Washington DC Mall a hair before 5am. I was meeting some friends to take photos of sunrise. The sunrise turned out to be quite lacking in color but I didn't want to give up on the day (I captured one photo with some true morning color). Once the gray had fully engulfed the sky I wandered away from the World War II Memorial toward the Vietnam Veteran's Memorial. It was around 8am and I wasn't expecting much. When I came down the path through the trees toward the memorial I noted one solitary veteran standing within the memorial walkway. He wore a black hat embroidered with "U.S. Army" in yellow letters and further adorned with small patches and pins. He held a camera in one hand and was pointing to names along the wall, allowing his fingers to guide his gaze. He'd stop a few times and take snapshots of a name on the wall, then move a little more and gaze again, occasionally moving his lips seeming to speak only to himself. I immediately recognized the emotion of the scene and went into "spy" mode. I stood at a distance with my 300mm lens and tried to document his actions as he moved. I then switched to a lens for closer work, slung my backpack on and decided to walk down to the memorial myself. When I passed behind him I greeted with a "good morning", which was warmly returned. Arriving at the junction of the east and west walls, I looked back and noticed he was still standing there, taking in the wall of names quietly. I'm not one to approach strangers very often but I got up the nerve to asked him if he minded if I took his photograph. The smartest thing I did all day. 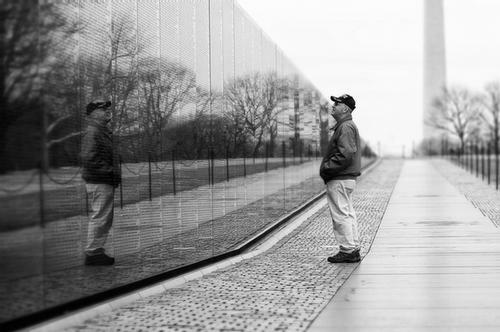 He didn't mind at all and mentioned he'd attempted to take photos just like the one I was taking...veterans visiting the memorial and capturing the emotional scene of their reflections intertwined in the names of fallen friends and comrades. He walked down next to me and we struck up an easy conversation. We talked about subjects that two people normally wouldn't address upon first introductions: jobs, books, war, politics, and history. Briefly delving deep into those subjects, the kind of conversation where you just "get" what the other person is saying. I learned he had worked in a photographic processing unit in Washington DC while serving in the Army before being sent to Vietnam as well. After about 30 minutes of conversation I finally asked what brought him to the memorial that day. He responded that he visits the Vietnam Veteran's Memorial every March 5th because that's the anniversary of the day he was shot in 1969. Taken off the front lines, bandaged up, and sent home where he admitted, without reservation, he joined in the protests against the war. We had a brief but real connection as we talked about the world we live in. A cold, quiet, and gray morning, not a soul around us, standing at the junction between the East and West walls, surrounded by the 58,267 names inscribed in the granite. Fifty eight thousand two hundred sixty seven. There's emotion to that experience that will only live in my head, forever eluding the capture of a camera's lens no matter how many photos I take. We may have been a generation apart, but years were no barrier to communication on this morning of March 5th. Amazing to think that this veteran and gentleman, who continues to serve our country, left a mark on me that will be as tough to erase as those names carved on the walls beside us. We shook hands, said a brief goodbye and walked away from each other heading back to our previously planned daily activities. As we exited, one of us along the East wall, the other along the West wall, I realized we'd remain strangers by at least one measure...we'd never even asked each other our names...and to be honest, the fact I don't know his name makes the experience all the more special. Maybe I'll visit again next March 5th and see where my camera leads me.